The reason for this Travel Information Printable is that while you are reading this, I am making my way (slowly) from Jamaica and home to my Squish. Hubby and I have spent the last 5 days at a resort here, but now its time to come back to reality (you can check out some of our adventures on my Instagram). Vacations are awesome, but I’d be lying if I tried to tell you I was 100% on board with this trip 100% of the time. Even though he just turned one, I had several (hundred) moments of doubt about leaving my baby for so long. With an ocean between us. For 5 bedtimes. Like I tend to do, I channelled all of my misgivings into productivity. It was easy since there is so much to do when preparing for a vacation. 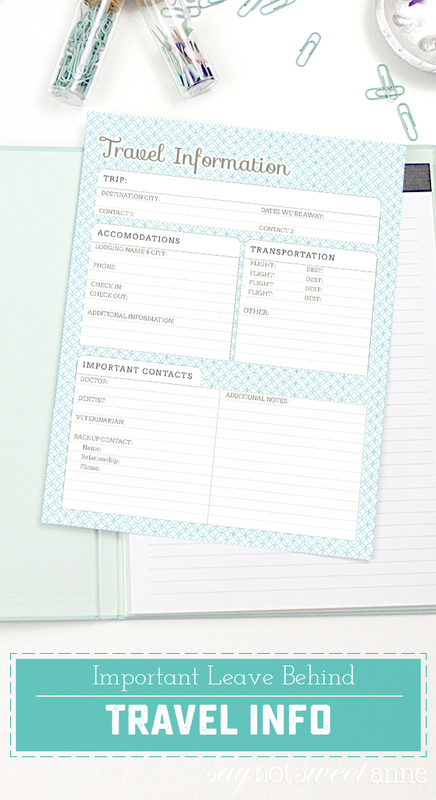 It was in a spurt of organized freak-out that I developed this Travel Information Printable. It made it a bit easier to leave my baby when I had prepared ahead of time. 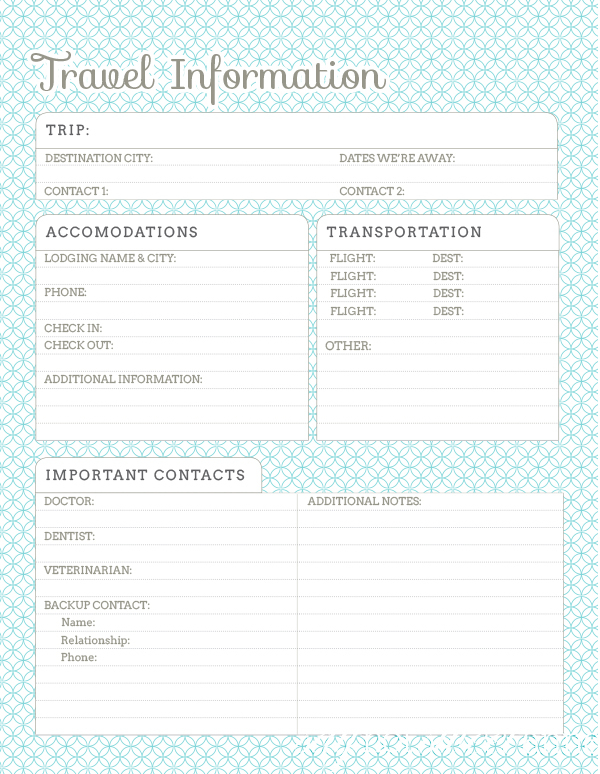 We assigned temporary guardianship to my mom via a notarized letter (there are plenty of templates out there), we made sure to leave house keys with the pet sitter and a close friend, we packed, unpacked and repacked to make sure we had everything, and I put all of our travel info in this document. I left a copy with my mom and 2 others so that everyone knew where we were and how to contact us. Somehow, that made me feel better. Thankfully there weren’t any huge emergencies and no one needed to contact us – but I’m glad we were prepared. If this printable can help just one anxious mama – I’m happy!